Grief is one of those emotions which cannot be contained within a set amount of time, nor within a range of reactions; as it is experienced by individuals in widely divergent ways. Generally it is those writers who have experienced a loss close to them, if they then choose to share it, who will then be able to convey the myriad of emotions surrounding a grieving character. However, one does not need to have traveled to Greece to be able to describe its beaches or tavernas to an extent that their readers believe the setting. So too, arguably, a writer need not have experienced a close friends death in order to allow their characters to display grief in an authentic manner. By understanding the effect grief has on a family/social units physicality and emotions, a writer can then explore ways to portray this in their chosen genres manner. There are technical challenges within writing about grief which other formats such as film or the creative arts are able to portray in more easily accessible methods for its audience. However, don’t let this stop you exploring ways to express grief and the process of bereavement. Grief is naturally static and writers tend to find it difficult to convey it without getting bogged down. Their challenge is to be authentic to the emotion but to also move the narrative along. The western world, as a general rule, is not culturally set up for grief. There are few instances in which we accept nor deal with it – for the most death is a secret and a dreadful surprise and shock to which no-one is equipped or prepared for. 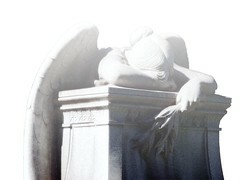 Death tends to be surrounded by family fits and arguments, grief bringing all the past hurts and woundings to the top. Those grieving will tend to alienate those who are near and dear and become consumed with the event. For most part there are no rituals or formal acceptance of death or the time after a passing; especially with mainstream society steering further away from the stayed religious doctrine. If there is no religious or sanctioned rituals, then it leaves huge holes with it the psyche of the individuals and this can lead to some interesting reactions and habits for characters to indulge in. In understanding the relationships and interactions of grief, writers can then begin to weave their craft around the theme. Structure can reflect the grief in its various forms. Your story could begin headlong rushing into events with everything seeming a blur, the detachment and disjointed conversations from those around the characters; the jaggered edges, the rawness. Your text can appear spontaneous; keeping it close or near to engage the readers emotions. A story can then slow down into the stillness of acceptance, utilizing imagery or metaphors. As an example, water has a great deal of lot of symbolism surrounding death and grief. With many grieving characters there is be the need to go back and touch things to remember the passed one by or to capture the moments shared. Grief is also full of secrets. A writer can use these to introduce back story through flashbacks or explanations. The keenest loss is the loss of senses – the touch and smell of the person who has passed. This can be a great tool utilized by the writer. Tactile and aromas have sturdy anchors within peoples minds and will bring the reader closer to the text. When writing about or portraying grief, things other than the emotions the character is experiencing can reflect their journey. Details of clothing ( in some cases a meticulous care or in others a slovenly approach), the environment, particularly the weather, the order and tidiness of the house or places of work can echo how the character is dealing with bereavement and grief without actually telling your readers. With grief there is the muteness and immobility of the person deeply entrenched in the emotion. However – there is also the drudgery and dreariness of just getting on with what is left of life and the loss of joy and the profound sadness. Anyone who has had an Italian or Greek widow as a neighbour or relative will understand the stoic nature and identity grief can take on for years after the passing. Writers, desperate to portray their characters emotions in an authentic manner, often steer clear of writing too extensively about grief as there are too many hackney and tired interpretations. However, by using the experiences which they currently have, coupled with a keen empathy of humankind and their observations skills, depicting a character whose grief is raw and real aught not have the difficulty it is perceived to have had. This is a great and helpful post. Thanks for tackling such a delicate topic. A close friend just lost her grown daughter to brain cancer. She was the sole day-time care-giver for the final two months, during which time the daughter was no longer able to communicate more than occasional confirmations. I don’t experience grief about this nearly the same way my friend does, but witnessing her grief up close and personal is powerful, and I think I could write from her perspective now.